La primera versión de producción en serie del Sherman, que era el tanque americano más común, con un total de 49 234 vehículos fabricados. Este tanque entró en combate por primera vez en el Norte de África. This was the U.S. Army's legendary tank of WWII. In WoT, the M4 Sherman is considered a very well rounded tank. It has good mobility and speed, and the armor, when manually angled, provides moderate shielding. The most popular gun for this tank is the 105 mm M4. It offers great damage, but sacrifices penetration. However, with a 100% crew, Improved Ventilation, and a Gun Rammer, the reload speed can go down to 7.50s and under, providing high damage per minute, especially when keeping an enemy tracked with HE to the tracks, a highly effective way to eliminate high HP enemies. The other "best" gun is the less popular 76 mm M1A1. This gun offers much better penetration, but loses 300+ alpha damage (if a 105mm HE shell would penetrate), about 30 damage (if the HE shell doesn't penetrate), and 240 damage for a penetrating HEAT round. The M1A1 is a better sniping gun and is much more reliable in its DPM when used correctly. The M4 is adept at almost any role, providing you know what you're doing. Mounting the 105mm or the 76mm gun allows the M4 to fill many different roles. 76mm M1A1 has the highest AP penetration of any tier 5 medium gun. No turret armor behind most of the mantlet. Low accuracy with the 105mm, mediocre with 76mm. Slow tank while stock; a T1 Heavy Tank with only top tracks can outrun you. The M4 Sherman is considered a very well rounded tank like the T-34 or PzKpfw IV, and is often considered one of the best, if not the best, Tier V medium. Its hull armor is a bit lacking and will most likely be penetrated by other tanks of its tier. However, it is not hopelessly thin; many lower-tier tanks will have a difficult time punching through the front armor. Its speed and maneuverability are average. Overall this tank is the Jack of All Trades of tier 5, and offers great guns for its tier. Due to its great gun depression it can fight on hills and use terrain features much more effectively than its counterparts, which is a compensation for its weak armor. By only exposing its strong frontal turret it can consistently damage enemies while bouncing shots itself. Depending on the weapon loaded, the tank may need to change tactics to match. The stock 75mm is accurate (although somewhat less so than its German and Soviet counterparts), and able to shred lower-tier tanks, especially light tanks. Both of the Sherman's gun upgrades, the 105mm Howitzer M4 and the are effective. The 105mm Howitzer M4 is a very powerful, close-range gun capable of damaging many opponents, if not outright kill them. While its has a long aim time, reloads slowly and is fairly inaccurate, the large HE charge in each shell will certainly one-shot many Tier IV vehicles, some Tier V tank destroyers and even Tier VII artillery. Although it may not destroy many of the thinner-armored tank destroyers in one hit on account of their hitpoints, it is still capable of severely damaging them, such as Hellcats. Even if minimal damage is done, it is still capable of damaging internal modules easily. It can also be fitted with the stock turret, easing the grind on the M4 considerably. The 76 mm Gun M1A1 is also another powerful option. While it may not have the raw power of the 105mm Howitzer M4, it possesses a very high-penetration gun capable of challenging most opponents. It is far more consistent in terms of damage, and can fire extremely effective premium ammunition that can punch through the frontal armor of almost all tanks it will face. The HE round, while never as powerful as 105mm howitzer shells, is still suitable for situations where HE is desired. However, it is less accurate than its German and Japanese counterparts, though more accurate than the Russian guns. Therefore, medium range is optimal engagement range. The tank is a versatile tank, able to be fitted for a variety of roles, and is an excellent tank for its tier. However, like all mediums, the Sherman should advance from behind allied heavy tanks when possible, providing fire support or, when the situation allows it, flank distracted enemy heavies to cause confusion. Sniping is also possible in some matches when equipped with the 76 mm Gun M1A1. With the Sherman's excellent gun depression, it is highly recommended that Sherman's take a hull down position or try to find cover in matches. Upon purchasing this tank, the only thing that carries over from the Lee is the SCR 506 radio. Generally, go for tracks, then gun (105mm M4, which doesn't require the next turret and stock turret has better armor), then engine, then radio, then turret. If you want the M1A1, tracks, turret, M1A1 (gun), engine, radio. The M4 Sherman, formally Medium Tank, M4, was the primary tank used by the United States during World War II. Thousands were also distributed to the Allies, including the British Commonwealth and Soviet armies, via lend-lease. In the United Kingdom, the M4 was named after Union General William Tecumseh Sherman, following the British practice of naming their American-built tanks after famous American Civil War generals. Subsequently, the British name found its way into common use in the U.S. The Sherman evolved from the Grant and Lee medium tanks, which had an unusual side-sponson mounted 75 mm gun. It retained much of the previous mechanical design, but added the first American main 75 mm gun mounted on a fully traversing turret, with a gyrostabilizer enabling the crew to fire with reasonable accuracy while the tank was on the move. The designers stressed mechanical reliability, ease of production and maintenance, durability, standardization of parts and ammunition in a limited number of variants, and moderate size and weight. These factors made the Sherman superior in some regards, to the German light and medium tanks that had swept across Europe in the blitzkrieg campaigns of 1939-41, and which still made up the majority of German panzer (albeit, usually in up-gunned and up-armored variants) forces in the later stages of the war. The Sherman ended up being produced in large numbers and formed the backbone of most Allied offensives, starting in late 1942. The original Shermans were able to defeat the relatively small German tanks such as the Panzer II and III they faced when first deployed in North Africa. Later, they found themselves seriously outmatched against newer up-gunned and up- armored Pz.Kpfw. IV and Panther medium tanks, and wholly inadequate against the armor and range of the Tiger I and later Tiger II heavy tanks, suffering high casualties against their heavier armor and more powerful 88 mm and 75 mm cannons. Mobility, mechanical reliability, and sheer numbers, supported by growing superiority in supporting fighter-bombers and artillery, offset these disadvantages to an extent. Later versions of the Sherman introduced 76 mm guns, giving them better armor penetration than the original 75 mm gun, though still insufficient at range against most late-war German tanks. Producing more Shermans was favored over rushing adoption of the heavier M26 Pershing, which was developed too late to play a significant role in the war. In the Pacific Theater, the Sherman was used chiefly against Japanese infantry and fortifications; in their rare encounters with lighter Japanese tanks with weaker armor and guns, the Sherman's superiority was overwhelming. Production of the M4 exceeded 50,000 units, and its chassis served as the basis for numerous other armored vehicles such as tank destroyers, tank retrievers, and self-propelled artillery. Only Mikhail Koshkin's design of the Soviet T-34 tank was ultimately produced in larger numbers during World War II. Many German generals and many historians considered the T-34 the best tank of the war, but even so, the Russians recognized the Sherman's particular advantages when they used them in certain niche situations. The Sherman would finally give way to post-war tanks developed from the M26. Various original and updated versions of the Sherman would continue to see combat effectively in many later conflicts, including the Korean War, the Arab-Israeli Wars, and Indo-Pakistani Wars into the late 20th century, against the T-34, and sometimes much more contemporary Soviet tanks. M4 and M4A1 (shown), the first Shermans, share the inverted U backplate and inherited their engine and exhaust system from the earlier M3 Lee. The U.S. Army Ordnance Department designed the Medium Tank M4 as a replacement for the M3 Lee and Grant Medium Tanks. The M3 was an up-gunned development of the M2 Medium Tank of 1939, itself derived from the M2 Light Tank of 1935. The M3 was developed as a stopgap measure until a new turret mounting a 75 mm gun could be devised. While it was a big improvement when tried by the British in Africa against early German panzers, the placement of a 37 mm gun turret on top gave it a very high profile, and the unusual inflexible side-sponson mounted main gun could not be aimed across the other side of the tank. Detailed design characteristics for the M4 were submitted by the Ordnance Department on 31 August 1940, but development of a prototype had to be delayed while the final production designs of the M3 were finished and the M3 entered full-scale production. On 18 April 1941, the U.S. Armored Force Board chose the simplest of five designs. Known as the T6, the design was a modified M3 hull and chassis, carrying a newly designed turret mounting the Lee's main gun. This became the Sherman. The Sherman's reliability benefited from many features first developed in U.S. light tanks during the 1930s, including vertical volute spring suspension, rubber-bushed tracks, and rear-mounted radial engine with drive sprockets in front. The designated goals were to produce a fast, dependable medium tank able to support infantry, provide breakthrough striking capacity, and defeat any tank then in use by the Axis nations, though it would later fall short against the much larger tanks eventually deployed by Germany. The T6 prototype was completed 2 September 1941. Unlike later M4s, the hull was cast and had a side hatch, which was eliminated from production models. The T6 was standardized as the M4 and production began in October. As the US approached entry in WWII, armored employment was doctrinally governed by FM 100-5 Operations (published May 1941, the month following selection of the M4 tank's final design). That FM stated that: "The armored division is organized primarily to perform missions that require great mobility and firepower. It is given decisive missions. It is capable of engaging in all forms of combat, but its primary role is in offensive operations against hostile rear areas." In other words, the M4 was envisioned to primarily fill the role of a cruiser tank, although the US Army did not use that doctrinal term. The M4 was not primarily intended as an infantry support tank; in fact, FM 100-5 specifically stated the opposite. It placed tanks in the "striking echelon" of the armored division, and placed the infantry in the "support echelon". Neither was the M4 primarily intended for tank versus tank action. Doctrinally, anti-tank engagements were the primary role of tank destroyers. The field manual covering the use of the Sherman (FM 17-33, "The Tank Battalion, Light and Medium" of September 1942) devoted one page of text and four diagrams to tank versus tank action (out of 142 pages). This early armored doctrine was heavily influenced by the sweeping initial successes of the German blitzkrieg tactics. Unfortunately, by the time M4s reached combat in significant numbers, battlefield demands for infantry support and tank versus tank action far outnumbered the occasional opportunities for cruiser tanks. Although envisioned primarily as a cruiser-type tank, US doctrine did also contemplate the M4's use in other roles. Unlike some other nations, which had separate medium tank designs tailored specifically for anti-tank roles (e.g., the German PzKw III) and support roles (the PzKw IV), the US intended the M4 to fulfill all roles. Although not optimized for tank versus tank engagements or infantry support, the M4 was capable of performing these missions to varying degrees. In the Pacific Theater, the Sherman was used chiefly against Japanese infantry and fortifications; in their rare encounters with lighter Japanese tanks with weaker armor and guns, the Shermans were superior. In World War II, the U.S. Army ultimately fielded 16 armored divisions, along with 70 independent tank battalions. 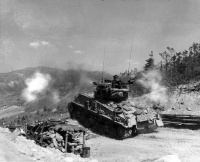 A third of all U.S. Army tank battalions, and all six U.S. Marine Corps tank battalions, were deployed to the Pacific Theater of Operations (PTO). However, prior to September 1942, President Franklin D. Roosevelt had announced a production program calling for 120,000 tanks for the Allied war effort, which would have created 61 armored divisions. Although the American industrial complex was not affected by enemy aerial bombing nor submarine warfare as was Japan, Germany and, to a lesser degree, Great Britain, the enormous drain of steel for tank production had been diverted to warships and other naval vessels. The use of steel for naval construction amounted to the equivalent of approximately 67,000 tanks: consequently, only about 53,500 tanks were produced during 1942 and 1943. The U.S. Army had seven main sub-designations for M4 variants during production: M4, M4A1, M4A2, M4A3, M4A4, M4A5, and M4A6. These designations did not necessarily indicate linear improvement: for example, A4 was not meant to indicate it was better than the A3. These sub-types indicated standardized production variations, which were in fact, often manufactured concurrently at different locations. The sub-types differed mainly in engines, although the M4A1 differed from the M4 by its fully-cast upper hull; the M4A4 had a longer engine system that required a longer hull, a longer suspension system and more track blocks. 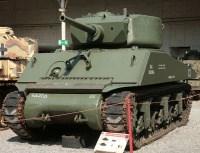 The M4A5 was an administrative placeholder for Canadian production, and the M4A6 had an elongated chassis, but fewer than 100 of these were produced. While most Shermans ran on gasoline, the M4A2 and M4A6 had diesel engines: the M4A2 with a pair of GMC 6-71 straight six engines, the M4A6 a Caterpillar RD1820 radial. These, plus the M4A4, which used the Chrysler A57 multibank engine, were mostly supplied to Allied countries under Lend-Lease. "M4" can refer specifically to the initial sub-type with its Continental radial engine, or generically, to the entire family of seven Sherman sub-types, depending on context. Many details of production, shape, strength and performance improved throughout production, without a change to the tank's basic model number; more durable suspension units, safer "wet" (W) ammunition stowage, and stronger armor arrangements, such as the M4 Composite, which had a cast front hull section mated to a welded rear hull. British nomenclature differed from that employed by the U.S. Early Shermans mounted a 75 mm medium-velocity general-purpose gun. Although Ordnance began work on the Medium Tank T20 as a Sherman replacement, ultimately, the Army decided to minimize production disruption by incorporating elements of other tank designs into the Sherman. Later M4A1, M4A2, and M4A3 models received the larger T23 turret with a high-velocity 76 mm M1 gun, which reduced the number of HE and smoke rounds carried and increased the number of anti-tank rounds. Later, the M4 and M4A3 were factory-produced with a 105 mm howitzer and a new distinctive mantlet in the original turret. The first standard-production 76 mm gun Sherman was an M4A1, accepted in January 1944, and the first standard-production 105 mm howitzer Sherman was an M4 accepted in February 1944. In June–July 1944, the Army accepted a limited run of 254 M4A3E2 Jumbo Shermans, which had very thick armor, and the 75 mm gun in a new, heavier T23-style turret, in order to assault fortifications. 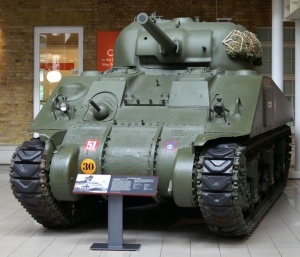 The M4A3 was the first to be factory-produced with the HVSS (horizontal volute spring suspension) suspension with wider tracks to distribute weight, and the smooth ride of the HVSS with its experimental E8 designation, which led to the nickname "Easy Eight" for Shermans so equipped. 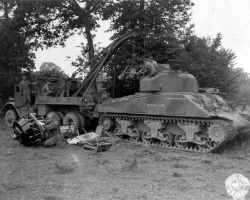 Both the Americans and the British developed a wide array of special attachments for the Sherman; few saw combat, and most remained experimental. 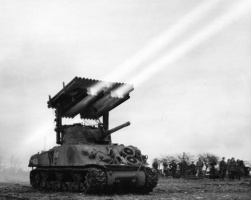 Those that saw action included the bulldozer blade for the Sherman dozer tanks, Duplex Drive for "swimming" Sherman tanks, R3 flamethrower for Zippo flame tanks, and the T34 60-tube Calliope 4.5" rocket launcher for the Sherman turret. The British variants (DDs and mine flails) were among "Hobart's Funnies", named after their commander, Percy Hobart of the 79th Armoured Division. The M4 Sherman's basic chassis was used for all the sundry roles of a modern mechanized force: roughly 50,000 Sherman tanks, plus thousands more derivative vehicles under different model numbers. These included M32 and M74 "tow truck"-style recovery tanks with winches, booms, and an 81 mm mortar for smoke screens, M34 (from M32B1) and M35 (from M10A1) artillery prime movers, M7B1, M12, M40, and M43 self-propelled artillery, and the M10 Wolverine and M36 Jackson tank destroyers. 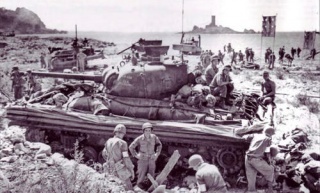 First type in U.S. service: A U.S. 7th Army M4A1 lands at Red Beach 2, Sicily on July 10, 1943 during the Allied invasion of Sicily. M4A3E8 participating in a World War II victory parade has front armor flat against both crew hatches compared to others that protruded above sloping armor. During World War II, approximately 19,247 M4 Shermans were issued to the US Army and about 1,114 to the US Marine Corps. The U.S. also supplied 17,184 to Great Britain, while the Soviet Union received 4,102 and an estimated 812 were transferred to China. These numbers were distributed further to the respective countries' allied nations. 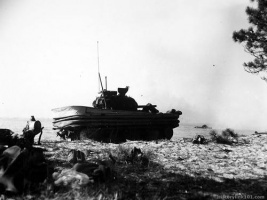 The U.S. Marine Corps used the diesel M4A2 and gasoline-powered M4A3 in the Pacific. However, the Chief of the Army's Armored Force, Lt. Gen. Jacob L. Devers, ordered no diesel-engined Shermans be used by the Army outside the Zone of Interior (the continental U.S.). The Army used all types for either training or testing within the United States, but intended the M4A2 and M4A4 to be the primary Lend-Lease exports. The Sherman was being issued in small numbers for familiarization to US armored Divisions when there was a turn of events in the Western Desert. Rommel had taken Tobruk and Egypt (and the Suez Canal) was threatened. The US considered collecting all Shermans together so as to be able to send the 2nd Armored Division under Patton to reinforce Egypt, but delivering the Shermans directly to the British was quicker and 300 had arrived there by September 1942. The M4A1 Sherman first saw combat at the Second Battle of El Alamein in October 1942 with the British 8th Army. 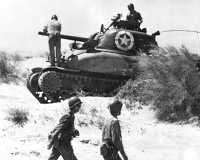 The first U.S. Shermans in battle were M4A1s in Operation Torch the next month. At this time, Shermans successfully engaged German Panzer IIIs with long-barreled 50 mm L/60 guns, and Panzer IVs with short-barreled 75 mm L/24 guns. Additional M4s and M4A1s replaced M3 Lees in U.S. tank battalions over the course of the North African campaign. The M4 and M4A1 were the main types in U.S. units until late 1944, when the Army began replacing them with the preferred M4A3 with its more powerful 500 hp (370 kW) engine. Some M4s and M4A1s continued in U.S. service for the rest of the war. Encounters with a company of Tiger Is, with their heavier armor and 88 mm L/56 guns, in Tunisia were typical of the mid-war period: the fearsome quality of a few German heavy tanks and their crews could be overcome by the quantity and mobility of the Shermans, supported by artillery and airpower, but sometimes at a great cost in U.S. tanks and crewmen. By June 1944, the Panzer IV had been up-gunned with a 75 mm L/48 weapon, and 75 mm Shermans were out-gunned on a regular basis. The first Sherman to enter combat with the 76 mm gun in July 1944 was the M4A1, closely followed by the M4A3. 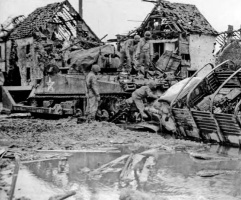 By the end of the war, half the U.S. Army Shermans in Europe had the 76 mm gun. The first HVSS Sherman to see combat was the M4A3E8(76)W in December 1944. M4 Shermans in the European Theater. While combat in the European Theater of Operations (ETO) consisted of high-profile armored warfare, the mainly naval nature of the Pacific Theater of Operations (PTO) relegated it to secondary status for both the Allies and the Japanese. While the US Army fielded 16 armored divisions and 70 independent tank battalions during the war, only a third of the battalions and none of the divisions were deployed to the Pacific Theater. Indeed, even the Imperial Japanese Army (IJA) deployed only their 2nd Tank Division to the Pacific during the war. The environment in which armor from both sides had to operate was generally described as tropical rain forests, which most armies simply classified as jungles. For this type of terrain, the Japanese and the Allies found light tanks easier to transport, maneuver and employ. 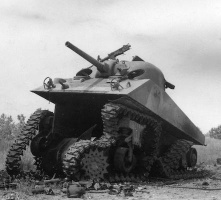 During the early stages of combat in the Pacific, specifically the Guadalcanal Campaign, the US Marine Corps M2A4 light tank fought against the equally matched Type 95 Ha-Go light tank; both were armed with a 37 mm main gun, however the M2 (produced in 1940) was newer by five years. By 1943, the IJA still used the Type 95 and Type 97 Chi-Ha medium tanks, while Allied forces were quickly replacing their light tanks with 75 mm-armed M4s. The Chinese in India had received 100 M4 Shermans and used them to great effect in the subsequent 1943 and 1944 offensives. Advanced tank designs, such as the IJA's 75 mm-armed Type 3 medium tanks, were saved for islands closer to the empire or for defense of the homeland itself. Consequently, very few were deployed to the outlying extended islands, again leaving 1930s-vintage light and medium tanks to do battle against 1940s-built medium Allied armor. During these latter years of the war, General Purpose High Explosive (HE) ammunition was preferred, because armor-piercing rounds, which had been designed for penetrating thicker steel, simply went through the thin armor of Japanese tanks, and often out the other side without stopping. Although the high-velocity guns of the tank destroyers were useful for penetrating fortifications, M4s armed with flamethrowers were often deployed, as Japanese fortifications were seldom destroyed by direct cannon fire. After World War II, the U.S. kept the M4A3E8 Easy Eight in service with either the 76 mm gun or a 105 mm howitzer. 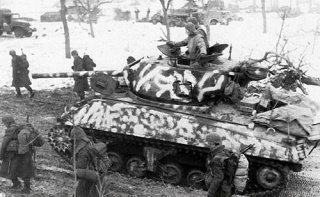 The Sherman remained a common U.S. tank in the Korean War. Despite no longer being the primary US tank, it fought alongside the M26 Pershing and M46 Patton. The M4A3E8 outperformed the T-34/85 in Korea. Both the Sherman and T-34 were comparable and could destroy each other when hit. The Sherman, however, had the edge because of its better optics which gave it a better chance of scoring a first round hit. The Army replaced them with Pattons during the 1950s. The U.S. continued to transfer Shermans to its allies, which contributed to widespread foreign use. The gun on the original M4 was the short-barreled medium-velocity 75 mm M3 gun. When the Sherman first saw combat in North Africa in late 1942 against the Panzer III and Panzer IV, its gun could penetrate the armor of these tanks at typical[clarification needed] combat ranges. U.S. Army Intelligence discounted the arrival of the Tiger I in late 1942 and the Panther tank in 1943, predicting that they would be produced only in small numbers. The U.S. Army failed to anticipate that the Germans would make the Panther the standard tank of their panzer divisions in 1944, supported by substantial numbers of Tigers. As a result, the Bureau of Ordnance, which had developed new 90 mm and 76 mm anti-tank guns in 1943, did not provide U.S. armored forces with the guns required to optimally fight the Panther and Tiger. Even in 1943, most German AFVs (later models of the Panzer IV, StuG III, and Marder III) mounted the 7.5 cm KwK 40. As a result, even weakly-armored light German tank destroyers such as the Marder III, which was meant to be a stop-gap measure to fight Soviet tanks in 1942, could destroy Shermans from a distance. The disparity in firepower between the German armored fighting vehicles of 1943 and the 75 mm M4 tank was the impetus to begin production of the 76 mm M4 tank in April 1944. The U.S. 76 mm proved to be comparable in penetrating power to the 7.5 cm KwK 40, the most common German anti-tank gun encountered during the fighting in France. Gen. Lesley J. McNair was head of Army Ground Forces. McNair, an artilleryman, championed the tank destroyer doctrine within the U.S. Armored Forces. Tanks were to support the infantry, exploit breakthroughs, and avoid tank-to-tank battles. Enemy tanks were to be engaged by the tank destroyer force, composed of a mix of towed and self-propelled tank destroyers. Towed "tank destroyers" were towed anti-tank guns. Self-propelled tank destroyers, called "gun motor carriages", were similar to tanks, but were lightly armored with open topped turrets. The tank destroyers were supposed to be faster and carry a more powerful anti-tank gun than tanks: armor was sacrificed for speed. 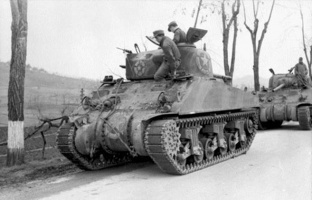 The tank destroyer doctrine played a large role in the lack of urgency in improving the firepower of the M4 Sherman, as the emphasis was on its role as infantry support. McNair approved the 76 mm upgrade to the M4 Sherman and production of the 90 mm M36 tank destroyer, but he staunchly opposed development of the T26 and other proposed heavy tanks during the crucial period of 1943 because he saw no "battle need" for them. In mid-1943, Lt. General Devers, commander of U.S. forces in the European Theater of Operations (ETO), asked for 250 T26s for use in the invasion of France. McNair refused. Devers appealed to General George Marshall, the Army Chief of Staff. Marshall summarily ordered the tanks to be provided to the ETO as soon as they could be produced. Soon after the Normandy invasion, General Dwight D. Eisenhower urgently requested heavy tanks (now designated M26 Pershing), but McNair's continued opposition delayed production. General Marshall intervened again and the tanks were eventually brought into production. However, only a few saw combat on February 25, 1945, too late to have any effect on the battlefield. This M4A2(76) HVSS shows the T23 turret with later 76 mm gun's muzzle brake. This one also has fenders, usually omitted on U.S. vehicles to ease maintenance. When the 76 mm gun was first installed in the M4 turret, it was found to unbalance the turret, and the gun barrel was also thought to protrude too far forward, making it more difficult to transport and susceptible to hit the ground on undulating terrain. Ordnance reduced the barrel length by 15 inches (from 57 calibers long to 52), which decreased performance by 10%. Mounting this gun in the original M4 turret proved to be problematic, and so the turret for the aborted T23 tank project was used instead for the definitive production version of the 76 mm M4 Shermans. Although tests against armor plate suggested that the new M1A1 76 mm gun would be adequate, testing against Panther tanks was never done. This would have shown that the gun could not penetrate the glacis plate of the Panther at any distance, and could only penetrate the center of the gun mantlet at 100 meters. The 90 mm gun developed by U.S. Ordnance could not be easily installed on the M4, but was installed on the open turreted M36 tank destroyer, and was the main gun for the T26 tank project (which eventually became the M26 Pershing). An attempt to upgrade the M4 Sherman by installing the 90 mm T26 turret on a M4A3 hull in April 1944 was halted after realizing it could not go into production sooner than the T26 and would likely delay T26 development. In testing prior to the invasion of Normandy, the new 76 mm gun on the M4 Sherman was found to have a undesirable muzzle blast that kicked up dust from the ground and obscured vision for further firing. The addition of a muzzle brake solved this problem by directing the blast sideways. It also had a much weaker high-explosive shell than the existing 75 mm gun. Standard Army doctrine at the time emphasized the importance of the infantry support role of the tank, and the high-explosive round was considered more important. Hence, the 76 mm M4 was not initially accepted by various US Armored Division commanders, even though a number had already been produced and were available. All of the US Army M4s deployed initially in Normandy in June 1944 had the 75 mm gun. The British were more astute in their anticipation of the future development of German armor: beginning development of a 3-inch anti-tank gun even before its predecessor entered service and planning for its use in tanks that would replace the M4. Out of expediency driven by delays in their new tanks designs, they mounted this high-powered Ordnance QF 17-pounder gun in a standard 75 mm M4 Sherman turret. These conversions became the Sherman Firefly. The 17 pounder still could not penetrate the glacis plate of the Panther but it could easily penetrate the Panther's gun mantlet at combat range. Moreover, it could penetrate the front and side armor of the Tiger I at nearly the same range that the Tiger I could penetrate the Sherman. In late 1943, the British offered the 17 pounder to the U.S. Army for use in their M4 tanks. Gen. Devers insisted on comparison tests between the 17 pounder and the U.S. 90 mm gun (even though the 17 pounder could be mounted in a standard M4 turret while the 90 mm gun needed a new turret). The tests were finally done on March 25 and May 23, 1944. They seemed to show that the 90 mm gun was equal to or better than the 17 pounder. By then, production of the 76 mm M4 and the 90 mm M36 tank destroyer were both underway and U.S. Army interest in the 17 pounder waned. High-Velocity Armor Piercing (HVAP) ammunition, standardized as M93, became available in August 1944 for the 76 mm gun. The projectile contained a tungsten core penetrator surrounded by a lightweight aluminum body, which gave it a higher velocity and more penetrating power. However, this new projectile was still unable to penetrate the glacis plate of the Panther tank, although it could penetrate the turret mantlet of the Panther at longer ranges than standard ammunition: it brought the U.S. 76 mm gun closer in performance to the British 17 pounder using standard APC ammunition. Because of tungsten shortages, HVAP rounds were constantly in short supply. Priority was given to U.S. tank destroyer units, and most Shermans carried only a few rounds and some units never received any. 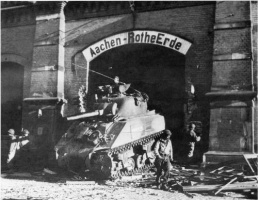 After the heavy tank losses of the Battle of the Bulge, in January 1945, General Eisenhower asked that no more 75 mm M4s be sent to Europe: only 76 mm M4s were wanted. Additionally, interest in mounting the British 17-pounder in U.S. Shermans flared anew. In February 1945, the U.S. Army began sending 75 mm M4s to England for conversion to the 17-pounder gun. Approximately 100 tanks were completed by the beginning of May. By then, the end of the war in Europe was clearly in sight, and the U.S. Army decided that the logistics of adding a new ammunition caliber to the supply train was not warranted. 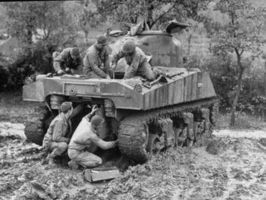 None of the converted 17-pounder M4s were deployed by the U.S., and it is unclear what happened to most of them, although some were given to the British as part of Lend-Lease. The higher-velocity 76 mm M1 gun gave Shermans anti-tank firepower at least equal to most of the German vehicles they encountered, particularly the Panzer IV and StuG. However, with a regular AP (Armor Piercing shot) ammunition (M79) or APCBC (M62) shells, the 76 mm might knock out a Panther only at close range with a shot to its mantlet or flank. At long range, the Sherman was badly outmatched by the Panther's 75 mm gun, which could easily penetrate the Sherman's armor from all angles. 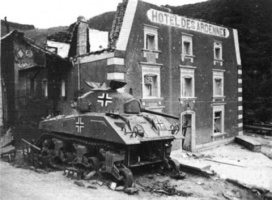 This contributed to the high losses of Sherman tanks suffered by the U.S. Army in Europe. A USMC M4A3R3 uses its flame thrower armament during the Battle of Iwo Jima. 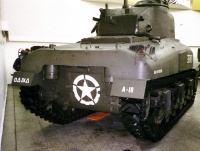 The Sherman was one of the first widely produced tanks to feature a gyroscopic stabilized gun and sight. The stabilization was only in the vertical plane, as the mechanism could not slew the turret. The utility of the stabilization is debatable, with some saying it was useful for its intended purpose, others only for using the sights for stabilized viewing on the move. A variant of the M4 Sherman was armed with the 105 mm M4 howitzer, which provided even more powerful high-explosive armament. This variant was employed in six-vehicle "Assault Gun" platoons in Armored battalions, to provide close fire support and smoke. The 105mm-armed variants were of limited use against enemy tanks due to the poor anti-armor performance of the howitzer, which was not intended to fight other tanks. The 75 mm gun had a white phosphorus shell originally intended for use as an artillery marker to help with targeting. M4 tank crews discovered that the shell could also be used against the Tiger and Panther. When the burning white phosphorus splattered against the German tank, the acrid smoke would get sucked inside the tank, and together with the fear of the fire spreading inside the tank, cause the crew to abandon the tank. There were several recorded instances where white phosphorus shells "knocked out" German tanks in this fashion. This early 75 mm gun turret on an M4A4 shows the single hatch — note the additional rectangular external (welded on) applique armor patch reinforcing the ammunition bin protection on the hull side. The steel frontal turret armor of the M4 ranged from 64 mm to 76 mm. sloped at a 30 degree angle, and the M4’s gun mantlet was also protected by 76 mm thick armor. The side turret was 50 mm at a 5 degree angle, while the rear was 64 mm at a 90 degree angle and the turret roof was 25 mm thick. The hull front sported 51 mm armor. Although the Russian T-34 is often credited for introducing sloped armor, the Sherman's upper hull was angled at a 56 degree angle while the lower half of the hull was curved. Historian Stephen Hart states the armor plates of the front hull were sloped between 45 and 90 degrees, which depended on the protrusions for crew hatches. The hull sides were 38 mm at the vertical to 45 mm thick. The hull rear, which protected and was offset from the rear radiator on some versions, was 38 mm to the vertical or sloped to 85 degrees. The hull roof was 25 mm. The armor of the M4 was effective against most early and mid-war anti-tank weapons, but was vulnerable to penetration from 75 mm L/48 tank guns up to a range of 1,370 – 1,500 meters. Regardless of this vulnerability, historian John Buckley has stated the M4 was "moderately superior" to the relatively small Panzer IV. Although the most advanced tanks were greatly feared, Buckley stated "The vast majority of German tanks encountered in Normandy were either inferior, or at least, merely equal to the Sherman." Regardless, the Sherman, like most Allied vehicles, remained vulnerable to infantry anti-tank weapons such as the Panzerschreck and Panzerfaust. Progressively thicker armor was added to hull front and turret mantlet in various improved models. Many had an additional rectangular patch on each side protecting ammunition storage, others had an additional slanted plate in front of each front crew hatch. Field improvisations included placing sandbags, spare track links, concrete, wire mesh, or even wood for increased protection against shaped-charge rounds, even though it had little effect. Mounting sandbags around a tank had little effect against high-velocity anti-tank gunfire, but was thought to provide standoff protection against HEAT weapons, primarily the German Panzerfaust and Panzerschreck. By 1945, it was rare to see a Sherman without any field improvisations. In the only study known to have been done to test the use of sandbags, on March 9, 1945, officers of the 1st Armored Group tested standard Panzerfaust 60s against sandbagged M4s; shots against the side blew away the sandbags and still penetrated the side armor, whereas shots fired at an angle against the front plate blew away some of the sandbags but failed to penetrate the armor. Earlier, in the summer of 1944, General Patton, informed by his ordnance officers that sandbags were useless and that the machines' chassis suffered from the extra weight, had forbidden the use of sandbags. Following the clamor for better armor and firepower after the losses of the Battle of the Bulge, Patton ordered extra armor plates salvaged from knocked-out American and German tanks welded to the front hulls of tanks of his command. Approximately 36 of these up-armored M4s were supplied to each of the armored divisions of the Third Army in the spring of 1945. The M4A3E2 Sherman Jumbo variant had even thicker frontal armor than the Tiger I. Intended for the assault to break out of the Normandy beachhead, it entered combat in August 1944. The M4 had an escape hatch on the hull bottom to help the crew survive and, in the Pacific, Marines used this Sherman feature in reverse to recover wounded infantry under fire. Combat experience indicated the single hatch in the three-man turret to be inadequate for timely evacuation, so Ordnance added a loader's hatch beside the commander's. 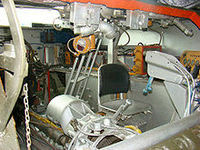 Later M4s also received redesigned hull hatches for better egress. Early Sherman models were prone to burning when struck by high-velocity rounds. The Sherman gained grim nicknames like "Tommycooker" (by the Germans, who referred to British soldiers as "Tommies": a tommy cooker was a World War I era trench stove). With gallows humor, the British called it the "Ronson", after the cigarette lighter with the slogan "Lights up the first time, every time!" Polish tankers referred to it as "The Burning Grave". This vulnerability increased crew casualties and meant that damaged vehicles were less likely to be repairable. The 1943 modernization program for older tanks added welded patches of appliqué armor to the sides of the turret and hull. Note also the Culin hedgerow cutter on the front, a field improvisation to break through the thick hedgerows of the Normandy bocage. Research conducted by the British No. 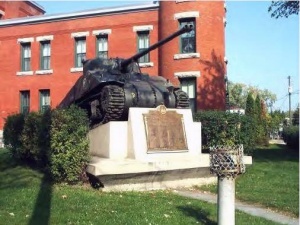 2 Operational Research Section, after the Normandy campaign, concluded that a Sherman would be set alight 82% of the time following an average of 1.89 penetrations of the tank’s armor. In comparison, they also concluded that the Panzer IV would catch fire 80% of the time following an average of 1.5 penetrations, the Panther would light 63% of the time following 3.24 penetrations, and the Tiger would catch fire 80% of the time following 3.25 penetrations. John Buckley, using a case study of the 8th and 29th Armoured Brigades, found that of the 166 Shermans knocked out in combat during the Normandy campaign, only 94 were burnt out, 56.6%. Buckley also notes that an American survey carried out concluded that 65% of tanks burnt out after being penetrated. United States Army research proved that the major reason for this was the stowage of main gun ammunition in the sponsons above the tracks. 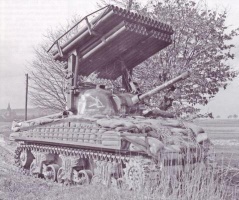 At first, a partial remedy to ammunition fires in the M4 was found by welding 1-inch-thick (25 mm) appliqué armor plates to the sponson sides over the ammunition stowage bins. Later models moved ammunition stowage to the hull floor, with additional water jackets surrounding the main gun ammunition stowage. This decreased the likelihood of the tank catching fire. 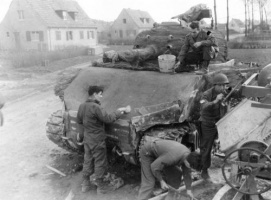 A U.S. Army study in 1945 concluded that only 10–15 percent of wet-stowage Shermans burned when penetrated, compared to 60–80 percent of the older dry-stowage Shermans The belief that the fuel tank was a culprit is unsupported. Most World War Two tanks used gasoline engines, and although fuel fires did occasionally occur in tanks, such fires were far less common and less deadly than a tank's ammunition magazines igniting. This assessment is supported by Buckley, who notes that in many cases the fuel tank of the M4 had been found intact after the tank burnt out due to the ammunition cooking off. Tank crew testimony also supports this position; eye witness reports describe "fierce, blinding jets of flame," which is inconsistent with gasoline-related fires but fits cordite flash. The U.S. Army restricted the Sherman's height, width, and weight so that it could be transported via typical bridges, roads, and railroads. This aided strategic, logistical, and tactical flexibility. The Sherman had good speed both on- and off-road. Off-road performance varied. In the desert, the Sherman's rubber tracks performed well. 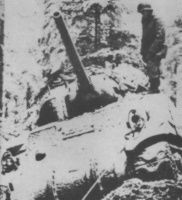 In the confined, hilly terrain of Italy, the Sherman could often cross terrain that some German tanks could not. "On the southwestern front (Italy) reports on the cross country mobility of the Sherman have been very favorable. The Sherman climbs mountains our tank experts consider inaccessible to tanks. 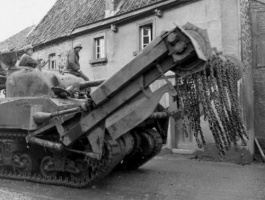 One great advantage is that the Sherman has a very powerful motor in proportion to its weight. Its cross-country mobility on level ground is, as the 26th Armoured Division reports, definitely superior to that of our tanks"
However whilst this may have held true compared with the 1st generation German tanks such as the PzKfpw. III & IV, actual comparative testing with the 2nd generation German tanks (Panther & Tiger) conducted by the Germans at their Kummersdorf testing facility as-well as by the US 2nd Armored Division, proved otherwise. Furthermore, U.S. crews found that on soft ground such as mud or snow, the narrow tracks gave poor ground pressure compared to wide-tracked second-generation German tanks such as the Panther and the Tiger. Soviet experiences were similar and tracks were modified to give better grip in the snow. The U.S. Army issued extended end connectors, "grousers" or "duckbills" to add width to the standard tracks as a stopgap solution. Duckbills were original factory equipment for the heavy M4A3E2 Jumbo to compensate for the extra weight of armor. The M4A3E8 "Easy Eight" Shermans and other late models with wider-tracked HVSS suspension corrected these problems, but formed only a small proportion of the tanks in service even in 1945. Amphibious tanks - Duplex Drive (DD) swimming Sherman. A British variant used by U.S. forces. The Sherman was extensively supplied through Lend-Lease to Allied countries. Britain took nearly 80% of Lend-Lease deliveries, some of which was passed on to other allies. The Soviet Union, between 1942 and 1945, received 3664 tanks M4A2 with diesel engines. Some of these remained in service for many years. After World War II, Shermans were supplied to some NATO armies. Shermans were used by U.S. and allied forces in the Korean War. Shermans also went to Israel. The Israeli up-gunned 75 mm M-50 and 105 mm armed M-51 Super Shermans are remarkable examples of how a long obsolete design can be upgraded in front-line use. They saw combat in the 1967 Six-Day War, fighting Soviet World War II-era armor like the T34/85, and also in the 1973 Yom Kippur War, proving effective even against newer, heavier Soviet tanks like the T-54 and T-55. Zaloga, Stephen J. Panther vs Sherman: Battle of the Bulge 1944. Osprey Publishing, 2008, p. 28. Berndt, Thomas. Standard Catalog of U.S. Military Vehicles (Krause Publications, 1993), pp.192-3. Zaloga, Armored Thunderbolt, "Bunker Blasters" p. 215-217 & 318 caption. Zaloga (M3/M5 Stuart) p. 35, "tank guns could not penetrate bunkers"
"12th Army Group, Report of Operations (Final After Action Report)" Vol. XI, Wiesbaden, Germany, 1945, pp. 66-67. "M4 Sherman at War" by Michael Green, James D. Brown, Zenith Press; 1st edition (February 15, 2007), pp. 87-88. Speer, Albert (2009). Inside the Third Reich. Ishi Press. p. 2nd note on chapter 17. ISBN 9780923891732. Berndt, Thomas. Standard Catalog of U.S. Military Vehicles. Iola, WI: Krause Publications, 1993. ISBN.0-87341-223-0. Buckley, John (2006) . 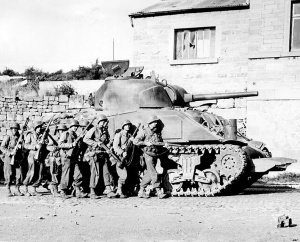 British Armour in the Normandy Campaign 1944. London: Taylor & Francis. ISBN.0-41540-773-7. OCLC 154699922.
Cooper, Belton Y (1998). Death Traps: The Survival of an American Armored Division in World War II. Novato, CA: Presidio. ISBN.0-89141-670-6. Green, Michael (2005). Panzers at War. City: Zenith Press. ISBN.978-0760321522. Green, Michael (2007). M4 Sherman at War. City: Zenith Press. ISBN.978-0760327845. Hart, Stephen Ashley (2007). Sherman Firefly Vs Tiger: Normandy 1944 (Duel): Normandy 1944. Osprey Publishing. ISBN.1-84603-150-8. Hernandez Cabos, Rodrigo; Prigent, John (2001). M4 Sherman. Osprey. ISBN.1-84176-207-5. Hunnicutt, R. (1978). Sherman. San Rafeal: Taurus Enterprises. ISBN.9780891410805. Jentz, Thomas (1997). Germany's Tiger Tanks Tiger I & II: Combat Tactics. Atglen, PA: Schiffer Military History. ISBN.0764302256. Reid, Brian (2005). No Holding Back. Robin Brass Studio. ISBN.1-896941-40-0. Schneider, Wolfgang (2004). Tigers in Combat I. Mechanicsburg, PA: Stackpole Books; 2nd edition, originally published 2000 by J.J. Fedorowicz Publishing, Inc. Winnipeg, Canada. ISBN.0811731715. Wilbeck, Christopher (2004). Sledgehammers. Strengths and Flaws of Tiger Tank Battalions in World War II. The Aberjona Press. ISBN.9780971765023. Zaloga, Steven (1993). Sherman Medium Tank 1942-1945. City: Osprey Publishing (UK). ISBN.9781855322967. Zaloga, Steven (1999). M3 & M5 Stuart Light Tank 1940-45. Osprey Publishing (UK). ISBN.978-1-85532-911-9. Zaloga, Steven (2008). Armored Thunderbolt. Mechanicsburg, PA: Stackpole Books. ISBN.9780811704243. "Tanks are Mighty Fine Things" (1946) — a 145 page book about the wartime manufacture of tanks by Chrysler Corporation - highly illustrated).